Sometimes an old tradition spawns a new one. 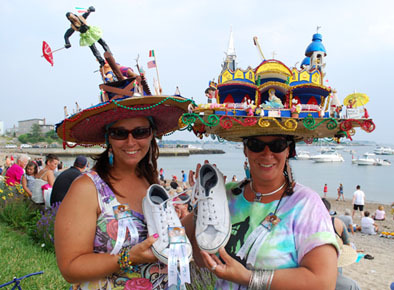 Sisters Robyn and Amy Clayton are known around Gloucester as "the Crazy Hat Ladies of Fiesta." Their outlandish hats have become an integral part of Saint Peter's Fiesta, which just celebrated its 86th year. The annual festival honoring the patron saint of fishermen is part religious devotion, part ethnic pride, and part boisterous revelry. Throughout the five-day festival, Greasy Pole competitions, Seine boat races, music, and dancing engage visitors. Fiesta also features a carnival, a temporary altar and outdoor Mass, and a blessing of over 100 Italian-American fishing vessels. Each year, the Clayton sisters make new hats that replicate in miniature key elements of Fiesta: church facades, temporary altars, St. Peter, working carnival rides, and Ambie the sausage man. Sometimes, their hats serve as visual commentary on local political controversies. On Sunday of Fiesta, a parade lasting over three hours marches through town, featuring religious groups carrying elaborate statues honoring Saint Peter, Mary, Jesus and others, while shouting prayers and salutations, "Viva! Viva! Viva San Pietro!" Robyn and Amy will be right there in the midst of it, more than happy to pose for pictures.